Concentric Pumps Ltd. has developed a suite of oil pumps for the new generation transmissions to be fitted in the Hyster and Yale diesel-powered materials handling trucks from Nacco Material Handling Group (NMHG). There is a total of five pumps in the range, all based on a larger, up-rated version of Concentric's existing external design. Two of the five are twin pumps, with a brake booster pump on the back. The transmission charge pumps are all of the georotor type, with Concentric's patented high-flow add-ons. 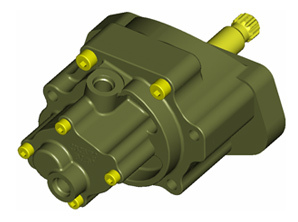 The booster pumps are all co-axial gear designs and are incorporated into the body of the host pump. The pumps deliver up to 50% increase in flow in the larger transmissions designed to cope with the increased performance and torque capacity of NMHG's 1 to 8 ton pushing-configuration trucks. Concentric has achieved the increased capacity by maximizing the rotor geometry and modifying the porting to cope with the increased flow. The pumps are all designed to achieve 1.5 million cycles at pressures of 200 psi for the charge pumps and 400 psi for the brake booster pump. In addition, the new designs are externally mounted and therefore easier to fit and service compared with the majority of their predecessors, which were fitted round the main drive shaft. Concentric is manufacturing three different displacement charge pumps within the same package size and mount face, so that they are interchangeable.